I am posting this here because the picture was taken in a staged setting indoors. 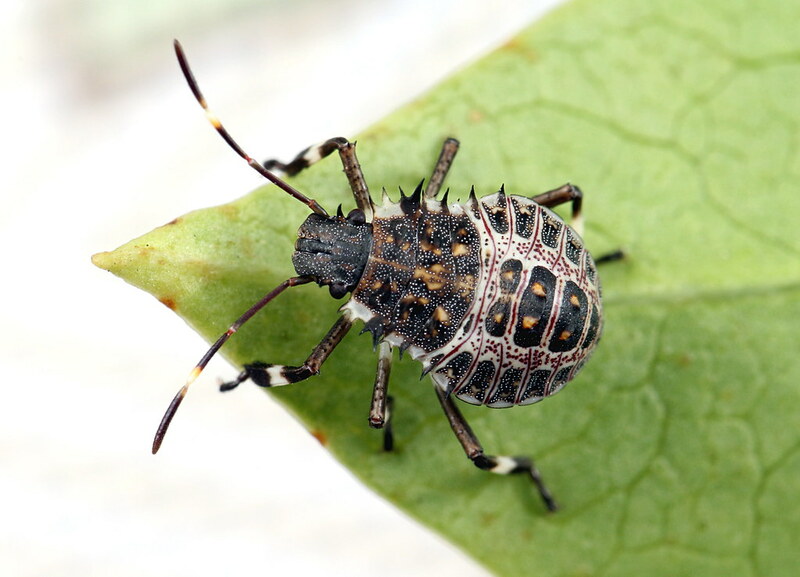 The common brown marmorated stink bug (Halomorpha halys) is an invasive species in the U.S. and they are generally not liked because they can gather in significant numbers, and they tend to show up in houses during the winter. The adults are definitely unremarkable, and one could see them as rather boring. Stink bug nymphs change their appearance as they grow, and I was pleasantly surprised to find that the nymphs of these insects pass through a stage where they are rather striking, as shown here. The combination of spines, gold studs, and white + pink markings suggests a fusion between punk rock and glam rock. At least it brings that idea to my mind. In any case, I will definitely be looking for these little bugs during the coming summer. nymphs are more generally regarded as divine spirits who animate or maintain Nature for the environments where they live, and are usually depicted as beautiful, young graceful maidens. Very good and clear shot. These nymphs also have a younger red and black stage, but they gradually change their appearance. Based on the many pictures of this species in BugGuide it seems that they take maybe two molts to look like this, then two more molts to the adult. I expect the earlier red and black stage is for warning coloration. I don't know what they are trying to 'say' at this stage. Do you still using the 50mm reversed on a pixco helicoid?